Wheat and barley (and sometimes rye) make up the foundation of most conventional grain-based products, both homemade and store-bought. So when you eliminate those grains—as you must when following the gluten-free diet—you've placed some fairly major grain-based staples off-limits. However, you've also opened yourself up to many new possibilities, including some you probably hadn't considered before. You can try interesting gluten-free grains and grain alternatives such as buckwheat, sorghum, tapioca, quinoa, and amaranth. Of course, rice and corn are popular and both are gluten-free, and many people with celiac disease and non-celiac gluten sensitivity eat copious amounts of both grains, in various forms. But venturing out beyond rice and corn to other interesting—although less well-known—grains and pseudo-grains has its rewards. Offbeat gluten-free grains offer unusual tastes that easily can surpass those of gluten grains. Plus, many are high in iron and fiber. Here's a list of our favorite gluten-free grains, plus some ideas on what you can do with them. Sorghum originated in Africa and now is cultivated in many tropical and sub-tropical countries worldwide. In the U.S., it's primarily used for animal feed, although its space in the gluten-free food market is growing. Sorghum, which tastes like a very mild, sweet corn, works well as an ingredient in gluten-free baking mixes, or cooked with water as a hot cereal. Combined with eggs and a little water, it makes decent (and quick) gluten-free pancakes. It's also frequently used to brew gluten-free beer, and you can use it to make a delicious gluten-free roux (as in this recipe for gluten-free roast chicken and shrimp gumbo). Sorghum is high in iron and fiber—half a cup of whole-grain sorghum flour provides about 25% of your daily iron requirement, plus 6 grams of fiber. Despite the off-putting name, buckwheat is not related to wheat and therefore is gluten-free. It's actually not a grain, either; instead, it's actually considered a fruit. But most cultures that have cultivated buckwheat use it as a grain substitute, most frequently as hot or cold gluten-free cereal. In fact, "kasha" is technically roasted buckwheat groats (but you shouldn't assume that cereals named "kasha" are all gluten-free, since many contain gluten ingredients). Half a cup of buckwheat groats contain about 6 grams of fiber, plus about 12% of your needed iron allowance and a trace of calcium. Buckwheat is super-versatile. For a delicious breakfast or brunch treat, try these buckwheat waffles with fresh Key lime curd. Many of us know tapioca from creamy tapioca pudding. But when used in a gluten-free diet, tapioca—a starch that's extracted from the root of the cassava plant—has many more uses than just dessert. Combined with sorghum and rice flour, tapioca flour can serve to provide a smoother, less gritty texture for gluten-free baked goods, which is why you see it as an ingredient in so many mixes. You also can use it to make gluten-free crêpes. Half a cup of tapioca (in pearl form) is fat-free and nearly protein-free—it's basically pure carbohydrate, and contains little fiber (which is probably why it provides such good texture in baked goods). Quinoa represents another pseudo-grain—it's actually more closely related to spinach and beets than it is to grain plants. 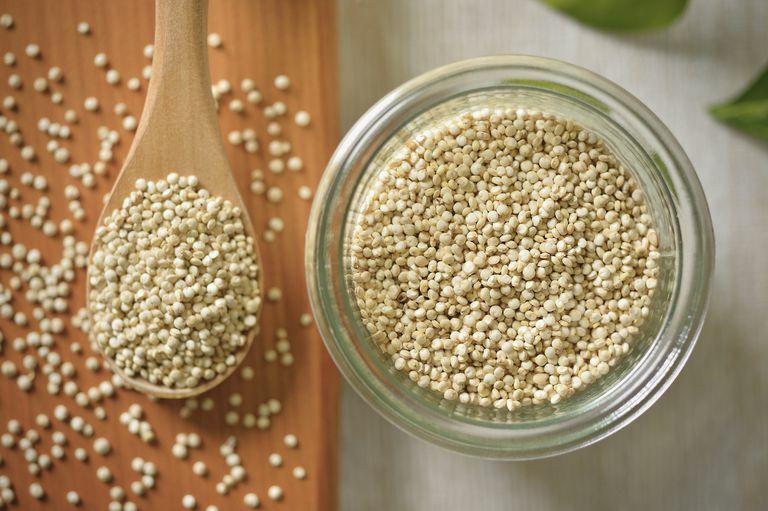 Almost unknown a decade ago, it's grown in popularity in large part due to the marketing efforts of one or two companies that sell quinoa and quinoa-based pasta products. Raw quinoa needs to be processed to remove its bitter-tasting coating. Processed this way and then cooked whole in water like oatmeal, it makes a nice, slightly nutty-tasting hot cereal. You also can use quinoa flour to make interesting flatbread. Quinoa originated in the Andes mountains and grows well at high altitudes, so many quinoa distributors get their crops from South America. Quinoa is a great source of plant-based protein—10 grams in a half-cup—and also contains lots of iron and omega-3 and -6 fatty acids. Quinoa also makes a great cold salad—try this vegetarian southwest quinoa salad. Technically, amaranth is an herb, not a grain. But that didn't stop ancient peoples in the Americas and Asia from using the plant's seeds like a cereal grain (to be fair, you can eat the leaves as well). It's possible to toast amaranth much like popcorn; in Mexico, bars of sweetened popped amaranth known as alegrias are very common. Amaranth is the best gluten-free grain source of iron—half a cup contains more than 40% of your daily iron requirement. It also contains plenty of calcium, magnesium and fiber, plus about 13 grams of protein. These five grains and pseudo-grains aren't the only gluten-free grains available, by far. You also can experiment with millet (great for hot breakfast cereal), teff (used in Ethiopia to make traditional flatbread called injera), and many different types of rice and corn. All in all, you may find that limiting your diet to gluten-free foods actually opens it up to a wide variety of new tastes.